San José, Calif., July 17, 2017 — Reconfiguring streets to reduce the number of travel lanes, know as a “road diet,” is becoming increasingly popular as communities look to create more livable places that better integrate transit, pedestrian, and bicycle infrastructure. When road diets work well, they are a relatively low-cost measure that improves safety, multi-modal accessibility, and quality of life in the neighborhood. Road diets are not without concerns, however. Travel times may increase along the slimmed road and, depending on the configuration of side streets, some traffic may switch to nearby roads less suited to handle that traffic. 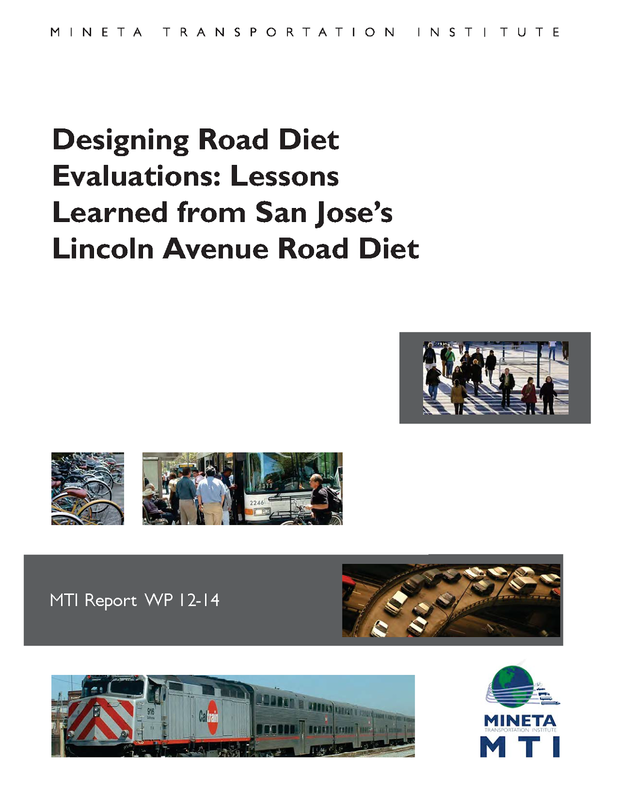 New research from the Mineta Transportation Institute, Designing Road Diet Evaluations: Lessons Learned from San José’s Lincoln Avenue Road Diet analyzes traffic impacts from the 2015 implementation of a road diet along Lincoln Avenue in San José, CA, and presents policy recommendations focused on designing road diet evaluations. How did the road diet impact traffic volume and speed along the road diet segment and surrounding streets? How did the impacts vary by time of day? 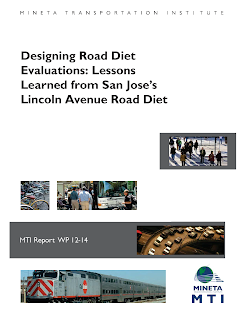 What strategies can be used to improve road diet evaluations? Data was collected at 45 different locations before the road diet implementation and again 1 year later. Traffic volume and speed data was analyzed for each data collection location and aggregated for four street types: Lincoln Avenue road diet locations, Lincoln Avenue location outside the road diet, major streets, and neighborhood streets. According to Dr. Hilary Nixon, “the road diet impacts vary considerably by location and time of day. The most aggregated measures, that is average all-day impacts for a specific street type, obscure important findings at specific location, as well as variations in impacts by time of day.” Within the road diet zone, traffic volumes and the number of speeders both fell with peak periods showing greater percentage declines than all-day counts. Outside the road diet zone, traffic volumes fell slightly or remained flat, although the number of speeders rose, particularly along major streets. Fortunately, most of the neighborhood streets saw less pronounced changes and the number of new speeders was low. Several policy recommendations were put forth by the research team to improve future road diet evaluations. First, without careful planning, it is easy to spend considerable time and money collecting road diet evaluation data that ultimately does not allow evaluators to assess impacts with any certainty or nuance. Second, it is important to analyze and present impacts for each data collection location, as well as by street types, by time of day, as well as by all-day metrics, and to look at both actual change in counts as well as percentage change. Designing graphics that emphasize the changes between pre- and post-periods is also important. Hilary Nixon, PhD and Asha Weinstein Agrawal, PhD are professors of urban & regional planning at San José State University. Cameron Simons is a housing market analyst at Trulia. At the Mineta Transportation Institute (MTI) at San Jose State University (SJSU) our mission is to increase mobility for all by improving the safety, efficiency, accessibility, and convenience of our nation's’ transportation system through research, education, workforce development and technology transfer. We help create a connected world. MTI was founded in 1991 and is funded through the US Departments of Transportation and Homeland Security, the California Department of Transportation, and public and private grants. MTI is affiliated with SJSU’s Lucas College and Graduate School of Business.